KUALA LUMPUR (Sept 17): The FBM KLCI fell 3.52 points or 0.17% to settle at 1,843.8 points at 5pm, ahead of the US Federal Reserve’s monetary policy announcement later this evening and Bank Negara's overnight policy rate decision tomorrow. 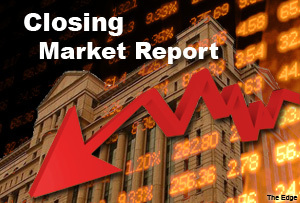 “The market is still soft due to anticipation on the announcement by the Federal Reserve. Also, crude palm oil and crude oil are weak at the moment. So, it makes sense that the market is not going up,” a remisier said. Across Bursa Malaysia, the total number of shares traded stood at 2.24 billion valued RM2.3 billion. Top gainers included British American Tobacco (M) Bhd, Fiamma Holdings Bhd and Syarikat Takaful Malaysia Bhd. United Plantations Bhd and Hong Leong Financial Group Bhd were among top decliners. Asia Bioenergy Technologies Bhd was the most-active stock. The KLCI had fallen ahead of crucial economic announcements by Malaysian and global policymakers. Malaysia's Statistics Department announced that the country's August inflation, as measured by the consumer price index, rose 3.3% from a year earlier. Bloomberg reported that the Federal Reserve will make announcements on its monetary policy at 2pm today (US time) (11pm Malaysian time). Tomorrow, investors will closely watch Bank Negara Malaysia's monetary decision on whether the central bank will continue to raise the overnight policy rate or maintain the existing 3.25% level. The spotlight will also be on the UK in anticipation of the referendum on whether Scotland should be an independent nation.